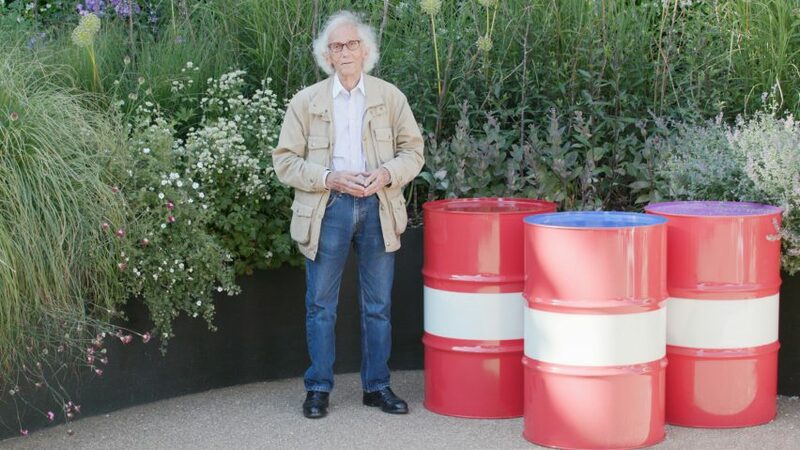 Artist Christo has compared the creation of his work to building a skyscraper, or a highway, in an exclusive interview with Dezeen, following the unveiling of his floating London Mastaba installation. The 83-year-old artist compared the often painful and lengthy process of getting permission for his giant artworks to the fraught process experienced by architects. "Many of our projects have dimensions of urban planning like building a highway or a bridge," he said. "They're so close also in the permission process. We face identical problems to people building a highway, or a skyscraper or a bridge." Many observers have noted the architectural scale and impact of Christo's work, and the artist pointed out that when he famously wrapped the Reichstag in Berlin in 1995 – following 20 years of planning – the New York Times sent its architecture critic to review it. However his work is "not at all architecture," he said. "Many people have difficulty to read our projects. They're not normal sculpture, they're not normal painting. Our work is what it is. They are totally works of art. They exist only because me and Jeanne-Claude want them to exist." Together with his late partner Jeanne-Claude, Christo creates monumental temporary artworks that often take years to plan and fund. To complicate matters, Christo never accepts commissions for his work, instead raising the money himself. "We never do commissions," he said. "This is why in all these years we realised very few projects and very many were not realised. We pay with our money. This is all our money." Christo was born in Bulgaria in 1935, fleeing the communist regime for western Europe in 1957. The following year he met Moroccan-born Jeanne-Claude in Paris. The two worked together until her death in 2009. Despite cancelling a project in the USA last year in protest at Donald Trump's presidency, Christo refuses to talk about politics. But he told Dezeen that his work is itself "real politics" because of the lengthy negotiating, lobbying and consensus building required to get projects off the ground. "I don't talk politics because mostly of art today is political illustration," Christo said. "Video and film, photography or painting, all that is illustration of things. Ours is the real politics: to get permission." "All our project have deep politics," he added, but instead of making political statements through the artworks, the political nature of each project derives from the journey to its completion. To make the Reichstag project happen "we defeated the chancellor and the prime minister of Germany" he said. "We defeated them to get permission and that is the real politics of the project." The London Mastaba – a hollow, flat-topped, 20-metre-high pyramid made of 7,506 stacked steel barrels painted in red, blue and mauve – was first conceived in 1962, with Christo eventually financing the £3 million cost by selling drawings and related artworks. "I'm not independently wealthy," he explained. "I sell original works of art [to fund my projects]." "It's my money, my freedom"
For the London Mastaba "we needed to have three million pounds to pay for the many things from the engineering to the workers to the material," he explained. "The barrels were fabricated in Holland. We need to pay for trucks, we need the factory, we hire workers, we need to have specialists. We get no money back. People don't understand." "All the quality, all the decisions are made because it's our money," he added. "It's my money, it's my freedom." Christo's London Mastaba is at the Serpentine in Hyde Park, London until 23 September 2018. The exhibition Christo and Jeanne-Claude: Barrels and The Mastaba 1958-2018 is at the Serpentine Galleries until 9 September 2018 and is free to visit.